I was born on Monday 22 August 1960 at 32-34 Chalermpol Street, Phol district, Khon Kaen province to parents Mr. Hok-Jing Sae-Lai, and Ms. Seam-Lung Sae-Tang. I was born as the seventh child of thirteen with three older brothers, three older sisters, three younger brothers and three younger sisters. My given birth name was Wichai Siriphonlai. - 1974 Completed primary school (year 7) from Phol primary school and passed the exam to Khon Kaen Wittayayon high school without burden to my parents. The reason I chose this school was to reduce the financial burden on my family at the time, as the tuition fee at the government school was lower compared to private school. - 1977 Graduated from Khon Kaen Wittayayon, junior high school. During Year 10, I believed that if I continued to study in Khon Kaen, I would be able to join medical school at Khon Kaen University, however, if I studied at Triam Udom high school in Bangkok, I would be able to join medical school at Chulalongkorn University. - 1979 Graduated from senior high school at Khon Kaen Wittayayon in Khon Kaen. Prior to graduating that year (year 12), the school started publishing an internal newspaper and I became the first editor. Teachers warned me with good intentions that if I kept doing this editorial role I may not be able to enter into medical school. I had this belief that if they did not accept me then who else would they accept. Therefore, I strongly believed it was certain that I would study in medical school at Khon Kaen University. This belief happened by itself and was a kind of a power. However, after I joined the medical school, I found that my friends were much smarter than me and that I should not think like that. - 1986 Graduated from Bachelor of Medicine from the Faculty of Medicine Khon Kaen University class 7. - 1992 Graduated as a specialist in Ophthalmology from the Faculty of Medicine Chulalongkorn University, Bangkok. - 1992 Graduated as Dharma scholar advanced level. Worked as a doctor at Arjan Fann Arjaro hospital and acting director of the hospital prior to my ordination. Early in March 1981 when I was in my second year of medical school, the Buddhism and traditional student association in Khon Kaen University had organised the second Dharma Ja Ric meditation camp at the end of semester. The program was held at Taam Sri Kaew temple, Phu Phan district, Sakon Nakorn province. Arjan Suwat Suwajo was a teacher in this program. He was a student of Arjan Faan Arjaro. At the time, I wanted to know all about meditation therefore I signed up to the program in order to practice meditation with the student association. Senior students in the association told me that we would practice 8 Precepts and eat only one meal a day. If anyone wanted to eat two meals, you would have to bring your own Mama (instant noodle) and finish eating before 12pm. I had no knowledge of the 8 Precepts and never ate less than 3 meals a day so I brought my Mama. However, it was troublesome to find hot water for Mama because they used a wood fireplace and they only cooked breakfast. Therefore, I had two meals only on the first day and gave away Mama to the central kitchen on the next day and had no problem. (This shows that thought and reality may not be the same). One strange thing from staying at the camp was that I woke up at 2am every day no matter if I went to bed at 10pm or 11pm. On the first night, I woke up at 2am and feared of ghosts since Phu-Phan was very quiet and had only sounds of animals looking for food at night. To solve this problem, I ducked under my blanket and continued to sleep. In the second night, I still woke up at 2am and thought about ducking under the blanket again. However, this time I asked myself a question, what am I here for? The answer was to practice meditation. Then I asked myself another question, is ducking under the blanket like this is right? I felt very ashamed of myself to hide under the blanket again. Therefore, I decided to sit up and meditate repeating Bhud-Dho, Bhud-Dho. My memory reminded me about ghost stories that I used to watch on TV. I told myself that it was impermanent and I continued to meditate until 4am, roughly for about 2 hours. After that meditation, there was no fear of ghosts left. Therefore, I continued to meditate at this time until the day I returned. Before leaving, Arjan Suwat told that me that "You have a gift from the past, keep on practising". After I returned, I continued to practice until a year had passed. I became confident that Buddhism did exist, it can be practiced, there were results and it can solve problems in our mind. I became confident that I would not change to other religions, remained faithful and wanted to be ordained. However, after considering several factors, I realised that it was not the right moment yet and told Luang Por Prasit Dhavaro who Dr. Smart introduced me to. Luang Por said "Let Kharma decides". I then continued to practice mindfulness (sati) until I graduated from medical school. During study, I had a chance to stay with Pra Arjan Suwat Suwajo at Watt Pra Sri Mahatard temple in Bang-Khen, Bangkok. I consulted with him that Pra Arjan Faan hospital is a large district hospital but the town had a small population. It would be tough to open a clinic for extra income. However, income was not important. By working there, I would be able to show my gratitude to my teachers. What do you think? I asked. He agreed with me. Therefore, I applied to work at Pra Arjan Fann Arjaro hospital. When I started to work and earned income, I was determined and donated part of my salary every month. After I completed 3 years of work to repay my scholarship, I decided to work for one more year and then be ordained. However, there was a factor that changed this intention. I went to the stupa of Pra Arjan Faan Arjaro and made a wish that if my path would change, let it be the acceptance to study ophthalmology at Chulalongkorn University (in Bangkok). Later on, I was accepted to study as I had wished. While studying at Chula, the work environment had changed. My mind recalled to my past intention to stay and help out at the Arjan Fann hospital for another year. I saw that I was attached to goodness. Up until the last two years of Luang Puu Tes Tes Rung See, he stayed at Taam Kham temple in Pannanikom district, Sakonnakorn province. I had a chance to look after him and told him about my progress in meditation. When I was a medical student, I read his book about the Five Precepts (Sila). I concluded from reading that Sila is stone, Sila is normal, Sila is kept at intention and to use your mindfulness to maintain your intention and not to violate the five harms. I told him of my conclusion. Luang Puu told me that you understood my book as most people did not. 1. Contemplate death. Whatever has not been done, hurry and do it before you die. 2. No matter what others have said, help yourself and survive first. 3. Doing in the world will never be finished, it will only expand. Doing in Dharma World has an end in yourself. Since then Luang Puu has never advised other Dharma again. He only asked if I had resigned from the hospital. I informed him that I was waiting for a new hospital director to take over. After he passed away, I resigned from work and became a monk. 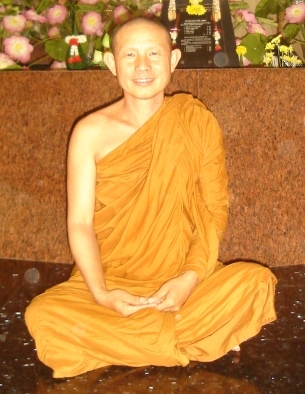 During the funeral of Luang Puu Tes, venerable Phra Arjarn Suwat Suwajo returned from America to Watt Taam Kham temple. I informed him that I had been ordained. He told me to stay with him, but I had already promised to stay with Luang Por Prasit so I did not accept his invitation. I followed the way of Karma - therefore, we must obey law of Karma as all beings are as a result of their Karma. We should never look at things with pleasure or hatred and be lost in good or evil. I was ordained and became a monk on 26 March 1995, at the age of 35 at Watt Kao Bhudha Kho Dom temple, Sriracha district, Chonburi province. Phra Kru Sathukijjanurak was a preceptor. Phra Damrong Chinna-Paymo co-hosted the ceremony with Phra Wichai Artaro. After my ordaination, I promised to myself not to go anywhere else and to stay and practice Dharma with Luang Por Prasit Dhavaro at Watt Tham Yai Prig temple, Sri-Chang district, Chonburi province until Luang Por Prasit passed away. Then I would reconsider where the Dharma would lead me to. I would not go with desire but with the way of Karma. With the intention I made, it made me steady to stay and study with him and I was also able to look after his health and other matters such as compiling a Dharma book "Core of Buddism - First series". The book was compiled from his teachings recorded on cassettes. No changes were made - all words were exactly from what was recorded. Luang Por told me to do it this way and he took full responsibility of what I did. I also compiled his biography from other recorded cassettes. This would be difficult for others to do since I knew Luang Por before the other monks or nuns. Therefore, I had more information than the others. Some records are from different occasions and were not in order. Even when I asked him, he couldn’t remember. I had to rely on many records or related personnel. After I finished, I read it out for him in his room (kuti). This is the only book that Luang Por listened from beginning to end which showed my gratitude to him. With this determination, it made me listen carefully to what he taught me. No matter what he said about me, I only contemplated what he said and taught and how it could be used to improve myself. This made me able to stay no matter what problem occurred. In the last year before he passed away, he had a vision about me and told me that I should go to the North-East. He passed away on 9 March 2007. In that year, I remained at the temple during the Buddhist Lent period to see if I could help with his funeral. When there was nothing else to do, I returned to my hometown in January 2008 (13 years since being ordained) to teach my parents who were very old (more than 80 years) and to repay my gratitude. My father and mother had donated land for the amount 68,712 square metres or 16.85 acres to build Wiweksikkaram forest monastery. I had a vision a few months prior to the passing of Luang Por Prasit that I was away and alone from others in an old temple that had no buildings but only 3 large jars and that I was taking a bath from water in these jars. When I arrived, it was true - the land was an empty paddy field. From January 2008, I started building and stayed here until present. 16 June 2009 Preached "Dharma in daily life" at SCG Chemicals Ltd. Rayong. 18 June 2009 Preached at Ratanakosin Sompote hotel, Bang khun Tien, Bangkok. 18-30 June 2009 Preached "Norm”, “Keep you mind in the middle”, “Unknown has concealed the truth of 5 Kant (groups)" in Perth, Australia. 1 July 2009 Preached "Patijja-SamuppaBath (The 12 sequential orders caused of sufferings)" at In Season Food Ltd. in Bangkok. 10 September 2009 Preached "Seeing causes, no Lost" at TB World Lease Ltd. in Bangkok. 18 April - 2 May 2010 Preached "Ordainment of female monks" at Perth-Newman, Australia. 4 May 2010 Preached "Lost in age and life" at SCG Chemical Rayong and other places such as Kiwi and KomKom Production Ltd.
21 October 2010 Preached "Carelessness in the life journey" at Sri Maha Sarakarm nursing college at Muang distrcit, Maha Sarakharm province on Nurse Day. 22 January 2011 Preached "Impermanent" at the cremation of Doctor Supachai SaraJaras, Watt Jang Jaroen, Muang district, Chonburi province. 16-17 February 2011 Preached "Mistaken notion and right view", "Journey in Samsara" at Bangkok Ratchasima hospital, Nakorn Rachasima (first visit). 8 March 2011 Preached "Way out of Mara(Satan)'s net" at Watt Taam Yai Prig, Sri Chang Island, Chonburi province. 28 April 2011 Preached "Origin of human" at Bankok-Rachsrima hospital, Nakorn Rachasrima province (2nd visit). 5 May 2011 Preached "Right view" at Baan Boon district, Khon Kaen province. 1. "Dharma Tesana-first series", first publishing 1 January 2010 (2500 copies). Second publishing in June 2010 (2500 copies), at Sin Koon publishing Ltd. By Khun Oil, Chun Dharm group and laypeople. 2. "Dharm Tesana-Second series", 6 chapters. Published by Khun Oil and laypeople. 3. "Tanha-Thitti-Mana make it slow", published by Phra Kittimate and laypeople. Being born as human is valuable and rare. Finding Buddha's Dharma is rare. Prior to fire being put out (death), hurry to move treasures from home (body). (Change of humanly treasures to noble treasures which is Donation, Sila and Contemplation). Otherwise, there is no gain from being born as human. Even humanly treasures have to return to earth. Hence, do not be complacent and throw away this rare opportunity. When the tide is high be quick and dip up, otherwise it will be difficult in the low tide.